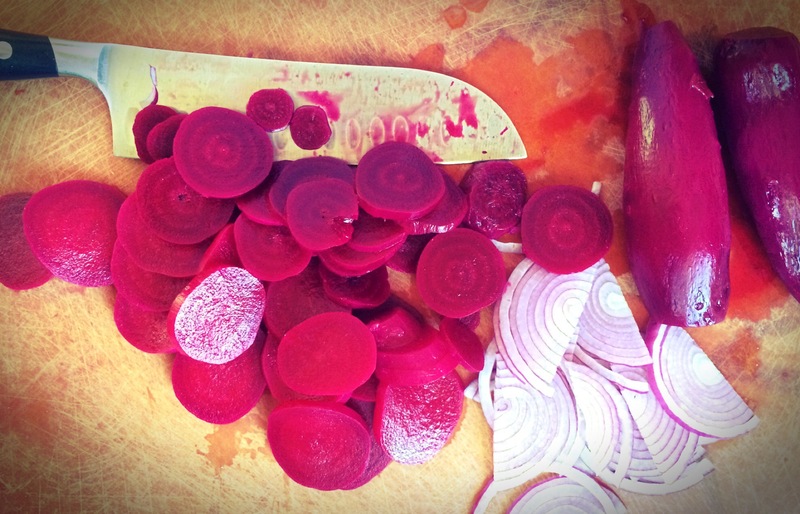 Cut up the ingredients: it is extremely important that all of the ingredients are cut as directed! Each piece must be of uniform size. Cut the vegetables and set them aside in a bowl. Prepare the aromatics as directed and set them aside as well. Make the sauce: In a small bowl, combine the sherry, broth, and soy sauce. Heat the wok: Turn on a stove burner to high. Set a 14” wok over the burner. The wok is hot enough when droplets of water dropped into it evaporate within 1 to 2 seconds of contact. Do not overheat the wok! Pull the wok off of the heat and add the oil: Swirl it around until it coats the sides and bottom. If the wok smokes wildly the moment you add the oil, it is too hot. Add the aromatics to the wok: Put the wok back on the heat. Add the garlic and chilies, and stir them for 10 seconds, until fragrant. Season the vegetables: Sprinkle the salt and pepper over the top. Stir-fry the vegetables for 1 minute, or until the vegetables begin to wilt. Add the sauce: Pour the sauce mixture around and down the sides of the pan instead of directly into the centre. Stir-fry and toss to coat the vegetables. Cover and cook for 15 seconds. Uncover and stir-fry for another 30 to 60 seconds, or until the vegetables are crisp-tender and brightly coloured. This is from America’s Test Kitchen, and is very good. Combine the ground turkey, cheese, salt, pepper, Worcestershire sauce, and mustard in a medium bowl until blended. Divide the meat into 4 portions. Lightly toss one portion from hand to hand to form a ball, then lightly flatten the ball with your fingertips into a 1” thick patty. Repeat with the remaining portions. Grill the burgers over medium fire until dark spotty brown on the bottom, about 7 to9 minutes. Turn them over, and continue to grill for 7 to 9 minutes longer. The centre needs to be completely opaque. Heat the oil in a large heavy skillet over medium heat until very hot. Swirl the oil to coat the bottom. Add the burgers and cook over medium heat without moving them until the bottom of each is dark brown and crusted, 3 to 4 minutes. Turn the burgers over; continue to cook for 3 to 4 minutes longer. Reduce the heat to low, and cover, with the lid slightly ajar to allow steam to escape, and continue to cook for 8 to 10 minutes longer, flipping once if necessary to promote deep browning, or until the centre is completely opaque. Serve on crusty buns with lettuce, tomato slices, red onion slices and mayo. This is a very good, basic recipe to have in your repertoire. It is a base for so many things, such as cheese sauce, and with added flavours, can substitute for processed canned soup in other recipes. Melt butter over medium-low heat. Blend in flour, and cook, stirring constantly until smooth; cook for a minute or two. Add the warm/hot milk, stirring constantly. Cook over medium heat until sauce thickens and comes to a boil. Reduce heat, simmer for two or three minutes to remove floury taste. Stir well. Will keep for a few weeks if kept airtight and dry. Cut the tenderloin into large cubes, and rub the spice mixture into it. “Marinate” in fridge for a minimum of 2 hours to a maximum of 24 hours. Tastes better if marinated longer. Thread onto skewers and grill.